(or my child) be at one? 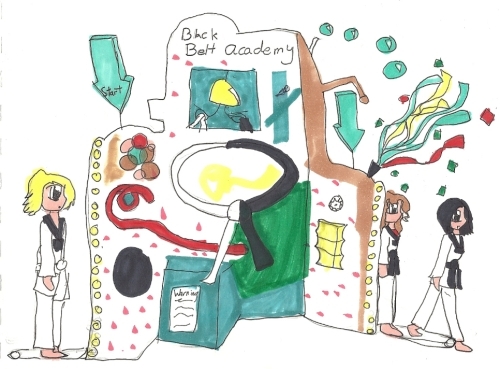 "Black Belt Factory": a martial arts school business model, the stated purpose of which is to get a student from white belt to black belt quickly and expeditiously. What in the world could be wrong with that? Martial arts is the study of self-defense methods. In ancient times, people without weapons learned to defend themselves by watching how animals fought each other (and them). They worked out kicks, punches, and moves, hoping to avoid their attackers and, perhaps, to disable them. The “art” part of it came about as this knowledge developed into specific procedures of defense and attack, taught by forms and exercises. Like other exercises and sports, martial arts trains students both mentally and physically. While practical self-defense is still the major objective, it is not the only objective. Many enjoy the competition or sport aspect, others enjoy the skill sets that they learn, and yet others enjoy the fitness aspects. Most master instructors of all martial arts teach that having a particular belt (rank) is not as important as having the skills and abilities necessary to develop proficiency in that martial art. Developing these abilities takes time. Each student is different, and their skill developments will proceed differently. Rank, these masters believe, should not be separated from real learning, because rank is not as important as real learning. Yet the goal of most students is the elusive, prestigious black belt - the rank that seems to ell the public you've "arrived" in the martial arts. Some master instructors have created a business model which I call a "Black Belt Factory." The main purpose of this sort of school is to get a student from point "A" (white belt) to point "B" (black belt) quickly and expeditiously – usually with a large contract price that "locks in" a student for several years until he or she receives the black belt. These schools may not focus on technique or discipline as other schools do; they may allow sloppy work in order to let the student advance because, after all, the student is guaranteed advancement and, ultimately, a black belt. These students usually receive their black belts after only a year or two, if they don’t quit. Unhappily, they often think they are much better than they actually are – a fact they learn first-hand if they enter a tournament and have to face a student who has much better foundational skills but holds the same or even a lower rank. I have seen a number of these schools (and was a student at one for a short time). I saw the result of one such black belt factory firsthand in a local tournament when in high school. In the forms competition I watched a blue belt student do a very sloppy execution of Teaguk Oh Jang (5). Not only did he finish last; his scores were a full point below the next-to-last-place finisher. In response, he claimed - loudly - that the judges were biased. Later that day, during the sparring competition, this same blue-belt student was eliminated by a green-belt competitor. His coach/instructor protested the match, saying that the opponent cheated. But, if I remember correctly, the green belt won because of fundamental kicking skills that actually worked – as opposed to the blue belt's wild, uncontrolled kicks that were easily avoided and countered. The same student eventually received his black belt and, as I recall, came to another tournament to fight in the black belt division. He lost by a score of something like 0 to 10. I'm not sure that he ever came to understand what a black belt really is. This student’s school was obviously one of these black belt factories, because every competing student from this school had the same sloppy execution in sparring and forms. They might have looked good inside their own dojang, but in a tournament they tended to fare poorly and make lots of excuses. How can you spot a "black belt factory"? Don’t sign up with the first school you visit, especially if you’re new to the study of martial arts. Visit several schools if possible. Seeing a number of schools, even schools that you may not be 100% serious about, will give you a better perspective. Ask questions about the programs. Some fully legitimate schools do offer long-term contacts (say, one year); however, this is different from a "Black Belt Program" which will guarantee you a black belt if you pay the fees (one-time or monthly). From that school’s merchandising perspective, it is advantageous to get you to black belt as quickly as possible. When you visit a school, take a look at the students, and ask how many have black belts. The retention rate – the number of martial arts students who stay in the program - at reputable schools is about 30% for those who achieve red belt status, and only about 15% for higher levels. If the location boasts that 90-100% of its students get black belts, you are probably in a black belt factory. Should you have any questions about a particular program, or want more help in how to look for a Taekwondo school, please let us know. The box below will send us your comments and questions. Do you know of or have experience with a "Black Belt Factory?" Do you know more ideas to help spot and identify a Black Belt Factory? Do you know a factory Black Belt? Are you willing to share your experience to help others? We would love to hear about your experience to help our readers and web searchers learn more... but please be diplomatic as you write!